On Sunday, July 17, 2011, Sean Hogan of Cistus Nursery, Portland, Oregon, gave a talk at Flora Grubb Gardens in San Francisco, California, entitled “The Art of the Rosette.” I’ve visited Cistus Nursery twice, so I know first-hand that it’s every inch a horticultural destination, in the same league as such legendary West Coast nurseries past as Heronswood and Western Hills. 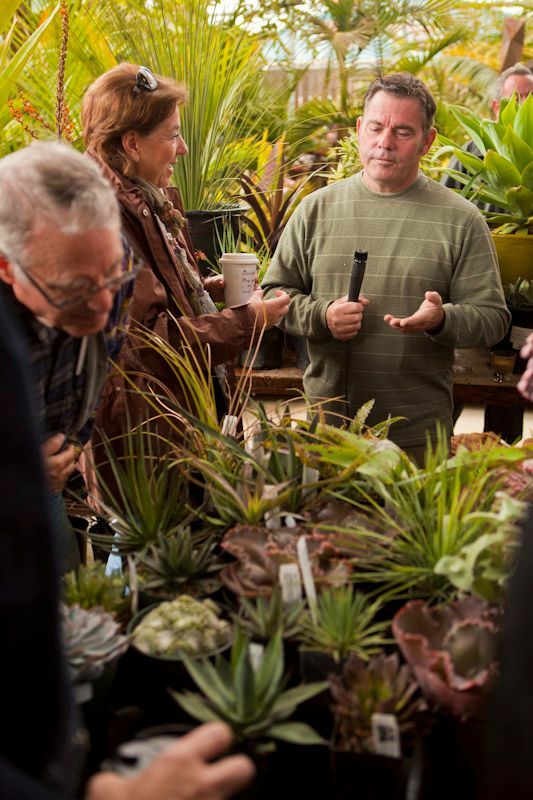 To have Sean Hogan so frustratingly close, a mere 300 miles away, proselytizing about succulents and agaves, one of my favorite subjects, was maddening. Over the last couple weeks I wheedled, cajoled, and outright begged MB Maher, also in San Francisco, to attend the lecture, maybe take a few notes and grab a couple photos. Which, despite a busy weekend schedule, he kindly did. 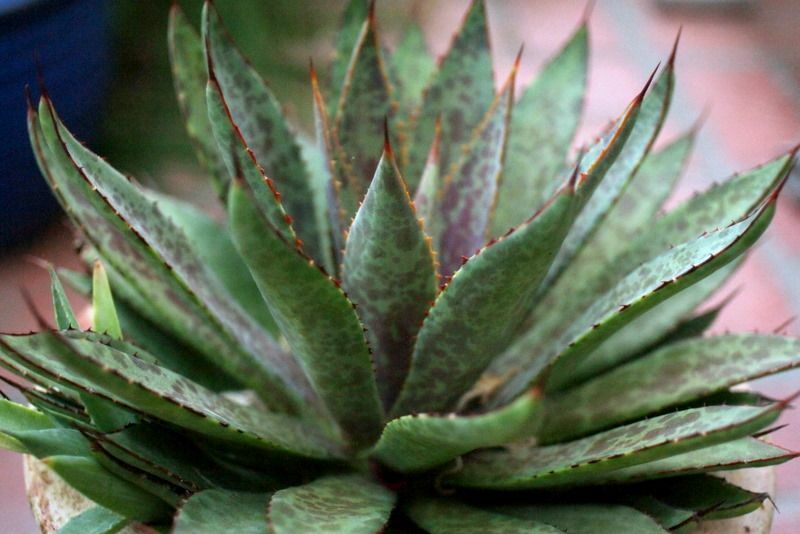 Bromeliads, aloes, manfredas, eucomis, yuccas, and some of the smaller agaves. Bromeliads discussed were terrestrial, such as puyas, and it was while on the subject of puyas that Sean acknowledged the masochism required to grow these spiny plants, even speculating they may have carnivore tendencies, since small rodents have been known to become impaled and trapped on their thorns. Hechtia texensis, a hardier terrestrial bromeliad similar to a dyckia from Texas/Mexico, was also given special mention. 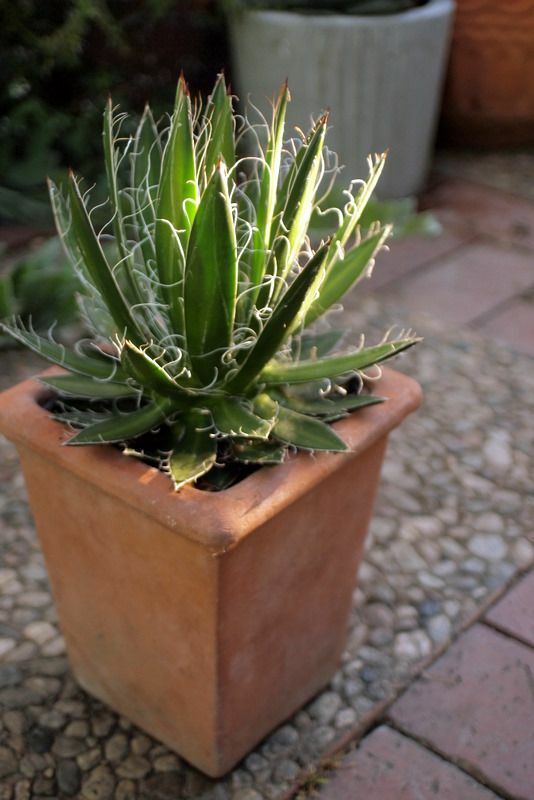 The diminutive aloe hybrid ‘Brass Hat’ was singled out as particularly fine for container culture. Also cited for fabulous rosettes were the manfredas and their complicated hybrid spawn like ‘Spot’ and Mangave undulata ‘Chocolate Chips.’ Below is my photo of my Mangave ‘Bloodspot.’ Such wonderful studies in rosette architecture. Eucomis, the pineapple lily, are to be appreciated for their tolerance of poor drainage. Their fast-growing, strappy leaves and dramatic summer flowers can enliven relatively static succulent plantings. I agree that they’re fabulous summer bulbs, in the ground or in containers. Sean feels yuccas are underused, underappreciated, and includes Yucca rostrata ‘Sapphire Skies’ in his top ten list of favorite plants, a spherical beauty hardy to zone 7 with almost a grassy texture. Also mentioned were Yucca nana, named just 12 years ago, from western Utah, hardy to zone 5, planted to good effect rising up out of iceplants and echeverias, as well as Yucca angustissima ‘Southside.’ A green roof project in Portland, Oregon included in its design 300 Yucca rostrata to add summer interest and structure, since vernal plants also used were summer-dormant. One-half inch of water three times during summer is all it takes to keep the yucca flourishing. He did stress, however, to include varying sizes and heights of agaves in the landscape, and not to be afraid of including the occasional large specimen. 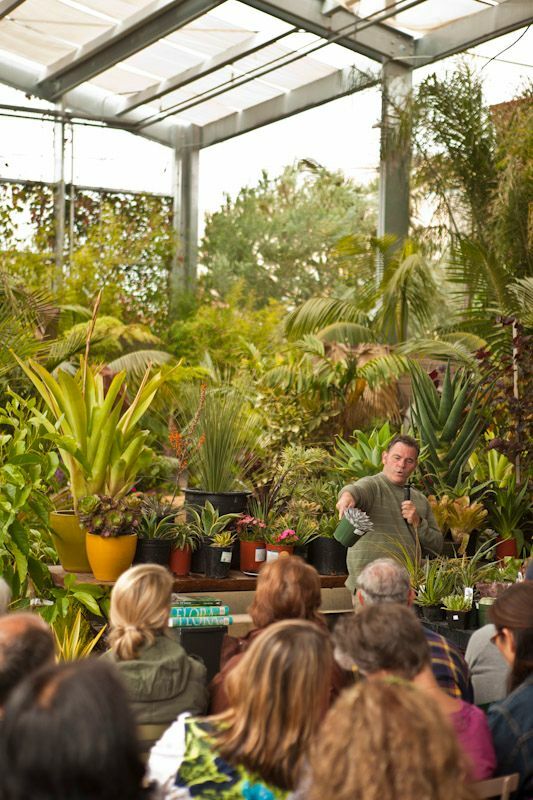 Sean also emphasized that succulents are like goldfish, in that they will adapt to the size of their container, staying small when confined. 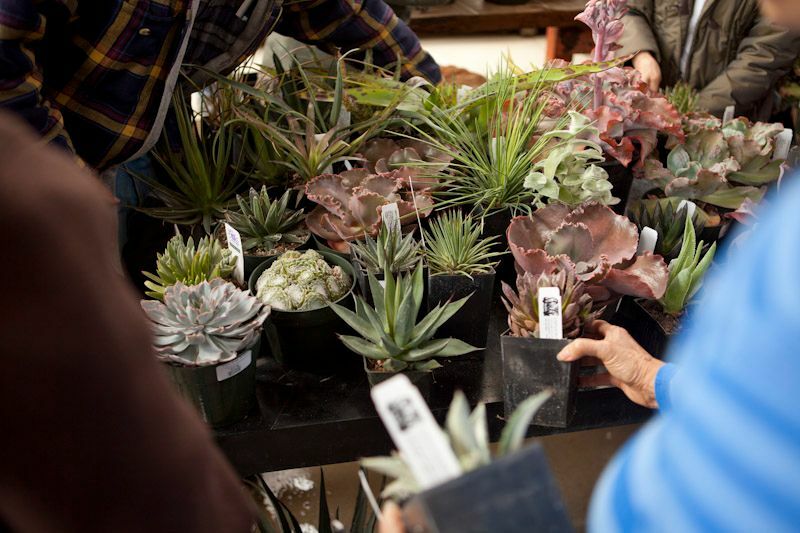 Apart from being unable to bring home an Agave funkiana ‘Fatal Attraction,’ I almost feel like I was there. 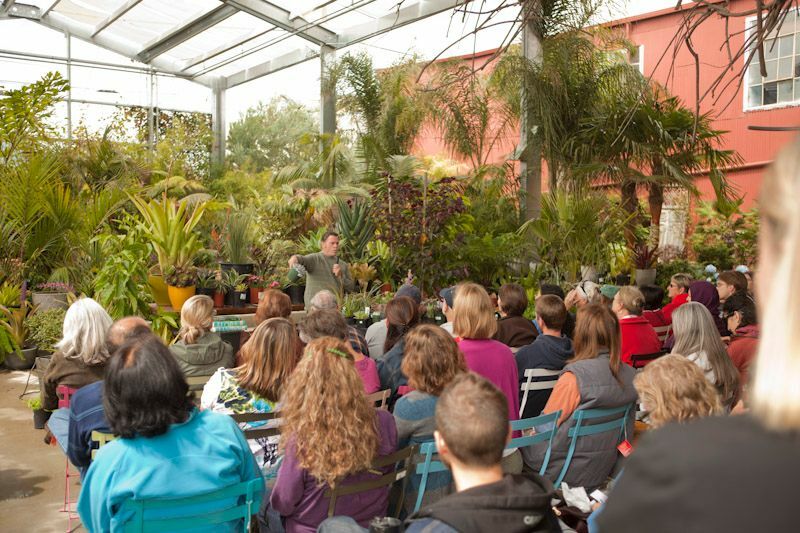 Huge thanks to MB Maher, for covering this wonderful lecture by Sean Hogan and to Flora Grubb Gardens for hosting such an exciting horticultural event. This entry was posted in agaves, woody lilies, Bulbs, MB Maher, pots and containers, succulents, The Hortorialist and tagged Agave 'Spot', Agave schidigera 'Black Widow', Agave schidigera 'Durango Delight', Agave schidigera 'Shira ito no Ohi', Aloe 'Brass Hat', Cistus Nursery, eucomis, Flora Grubb Gardens, Hechtia texensis, Mangave 'Bloodspot', Mangave undulata 'Chocolate Chips', Opuntia fragilis, Plantlust, Sean Hogan, Tradescantia sillamontana, Yucca angustissima 'Southside', Yucca nana, Yucca rostrata 'Sapphire Skies'. Bookmark the permalink. I don’t have very many of these “rosette” type plants but I do love my Yucca rostrata ‘Sapphire Skies.’ What a fun event. Love those two close up photos! Oh, I thank MB Maher, too! I had not heard of this plant – Hechtia texensis – and since I’ve not had success with Dykia (I’m sure it’s me, not the plant or the Phoenix climate) I can try some of the Hechtia! The Chihuahuan desert is a neighbor to the Sonoran, surely I can get one to thrive here, right? Right? Since I so often read you Californian gardeners blogs and turn green with envy this post was a wonderful read. Not only was it full of MB Maher’s fabulous photos but these are Cistus plants!!! Which I can go buy! (yippee!!!). Now I just need to convince Sean to rewrite this talk for the PNW and give it here soon! Thanks Denise! Grace, that’s a great one to have if you’re only going to have one. Jenn, I hadn’t heard of Hechtia either, but how cool to have a hardier option to dyckias. Couldn’t find a good photo. Loree, you’re most welcome. Plant Lust is invaluable! I always think of your Sammy as the definitive Yucca rostrata. Nice shot,i wonder if you are using DSLR or just an ordinary camera?